In the following videos you can see the earliest tests made on x2VGA video converter. The x2VGA video converter used in these videos is the prototype, that means that the ultimate product will have different shape and size. 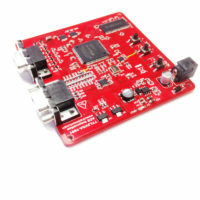 x2VGA video converter has been tested on several industrial machines. In the following two videos the substitution of two LCD monitors on APM and Protti knitwear machines is shown. The CRT monitor has been replaced with a brand new LCD monitor. Upon request, it is possible to provide an open frame 10” LCD monitor, so that you can place the converter right in the case of the machine, instead of the old CRT monitor.